What a great way to bring the pumpkin in to help celebrate a child’s first Halloween. It was found that tracing the feet and hands onto paper and then cutting it out to use as templets worked best. Trace and then cut with saw blade from a pumpkin carving set. 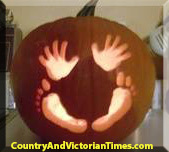 Using a drawn set of hands and feet would also be a great way to make a pumpkin to display for family and friends to learn your exciting news that you are expecting. This entry was posted in Crafts ~ DIY ~ Projects, ~Baby, ~Halloween and tagged 1st, announcing, announcment, Children and Youth, first, holidays, Jack-o'-lantern, pregnant, pumpkin, Pumpkin Carving, ~Baby, ~Halloween. Bookmark the permalink.